Vintage Recipe Blog: Exericse Equipment? #1 - The Camano Coffee Mill from Red Rooster Trading Company. I've had this thing for 3 years now and I've never had a problem with it. That's because it's made in America! If you've never ground your coffee by hand I strongly urge you to start. Burr grinders are best for getting the perfect grind and because it's hand powered it's green energy. The mill itself is built to last several lifetimes and looks splendid sitting on the counter top. 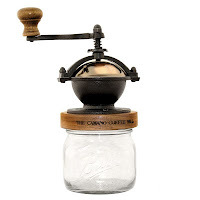 There was some initial resistance in the household when I encouraged the switch from the electric grinder to the mill but soon even the naysayers were fighting for their turn to grind the coffee. It's great for toning the upper body muscles, and best yet, it gives a perfect, even grind every time. #2 - My trusty Plumb Roofing Hatchet. This was a hand me down from my great grandfather who bought it around 1922. It's still in fine condition and cuts through weeds and trees like magic. I needn't tell you that even a half hour of swinging this thing is a workout but at least you're accomplishing something rather than sitting on a bike that goes nowhere. 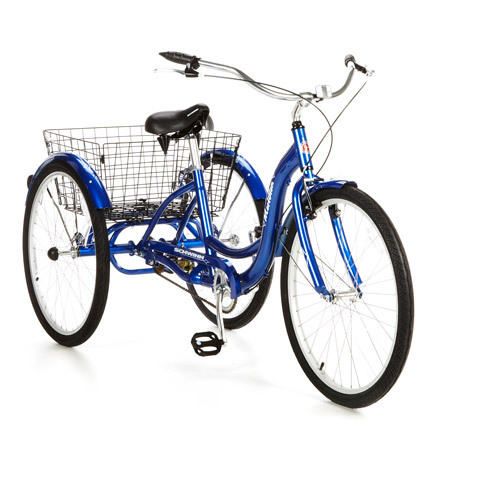 #3 - Finally, speaking of bikes I have a trike. I was born with reversed eardrums so no matter how I try, I find it impossible to balance a bicycle. Good thing that the adult trikes have become the vogue lately because it allows me to take the bike up to do some grocery shopping without spending gas money.